B&B 94Rooms Vatican-Scipioni v Řím, Itálie: Zarezervujte nyní! 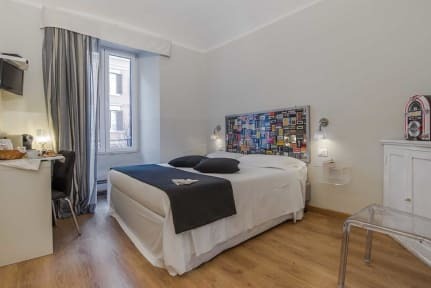 Our Guesthouse in Rome Centre is an excellent starting point for a tour of the city, because it is located in one of the most beautiful residential areas, the Prati district. From the B&B Rome near Vatican city is possible to walk to St. Peter's Basilica, the Vatican Museums, Borgo Pio, Piazza del Popolo and the historic center of the city, as well as the popular and well-known Via Cola di Rienzo, a must for shopping and wellness centers. 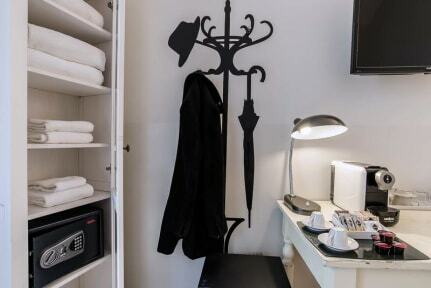 B&B 94Rooms Vatican-Scipioni is located near the subway, so it is convenient accommodation for tourists who want to move in a quick way through the city. The Bed and Breakfast offers thematic rooms, inspired by the five senses: sight, touch, taste, hearing and smelling. Each room is furnished in a simple and modern style, with attention to detail to ensure maximum comfort. There are many famous attractions close to this B&B such as the Castle Sant’Angelo, the Vatican Museums, St Peter’s Basilica and the popular shopping area Via Ottaviano. This property may pre-authorize yuor card before arrival. Check in from 14:00 to 24:00. NOT REFUNDABLE RATE: The Total amount will be cashed at the time of the booking and is NOT REFUNDABLE in case of change or cancellation. Free baby cot subject to availability so please make sure you let us know. Animals only accepted if small size. Possibility of transfer from / to airport cost 50 euro 2 pax.